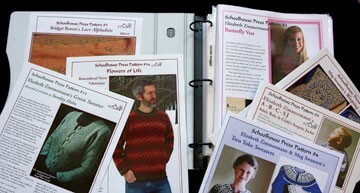 Archival quality binders (made from 65% recycled material) for your Schoolhouse Press patterns. 8.5 X 11, 1.5", holds up to 80 sheet protectors, black w/ white inside, outer label pocket on spine with convenient card to identify the contents plus a hole to enable you to hook it out of the bookshelf. This binder matches our smaller Wool Gathering binder (below).